Local authors discuss and sign their latest space opera novel Tiamat's Wrath: The Expanse Book 8. 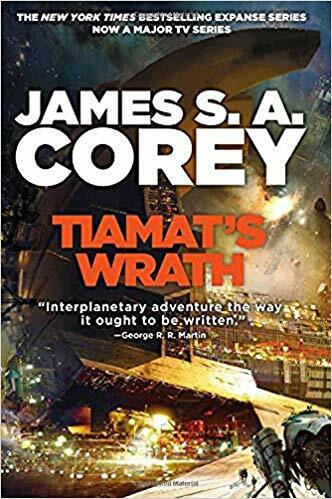 James S.A. Corey - best-selling local authors Daniel Abraham and Ty Franck under a pseudonym - will be at Page One Books 4:00 pm Saturday, March 30, to talk about and sign their latest space opera novel, "Tiamat's Wrath: The Expanse Book 8." A major TV series based on the "Expanse" novels finished its third season on the SyFy Channel in 2018, and its fourth season will premiere on Amazon Prime Video this year. The book is described as such: "The eighth book in the NYT bestselling Expanse series, 'Tiamat's Wrath' finds the crew of the Rocinante fighting an underground war against a nearly invulnerable authoritarian empire, with James Holden a prisoner of the enemy. Thirteen hundred gates have opened to solar systems around the galaxy. But as humanity builds its interstellar empire in the alien ruins, the mysteries and threats grow deeper. In the dead systems where gates lead to stranger things than alien planets, Elvi Okoye begins a desperate search to discover the nature of a genocide that happened before the first human beings existed, and to find weapons to fight a war against forces at the edge of the imaginable. But the price of that knowledge may be higher than she can pay. At the heart of the empire, Teresa Duarte prepares to take on the burden of her father's godlike ambition. The sociopathic scientist Paolo Cortázar and the Mephistophelian prisoner James Holden are only two of the dangers in a palace thick with intrigue, but Teresa has a mind of her own and secrets even her father the emperor doesn't guess..."
Corey is the pen name of fantasy authors Daniel Abraham and Ty Franck. They both live in Albuquerque. Find out more about this series at www.the-expanse.com. Under Corey, they also wrote a "Star Wars: Legends" novel. Abraham is the author of the critically-acclaimed "Long Price Quartet." He has been nominated for the Hugo, Nebula and World Fantasy awards, and won the International Horror Guild award. He also writes as MLN Hanover and (with Ty Franck) James S.A. Corey. Franck was born in Portland, OR, and once worked as an assistant to George RR Martin. In addition to "The Expanse" series, he also was story consultant for the "Game of Thrones: A Telltale Games Series" video game and has contributed to the "Wild Cards" anthology novels. Page One Books is located at 5850 Eubank Blvd NE, Suite B-41, in Albuquerque's Mountain Run Shopping Center (southeast corner of Eubank and Juan Tabo). The Corey (Abraham & Franck) event is free and open to the public. For more information, please call 294-2026 or visit www.page1book.com.